Glebe is having a dumpling led revolution. Today we are joined for lunch by our fan, Mel. She's currently our major reader, and suggests lunch in Glebe, but not Thai. Glebe Noodle House has been open for a few months, but I haven't managed to entice any takers to try it out. I've been having super handmade noodle cravings that needed to be sorted fast, and a lunch date with Mel sorts out the choice. The service is friendly and we're escorted upstairs to a bright and breezy balcony overlooking Glebe Point Rd. 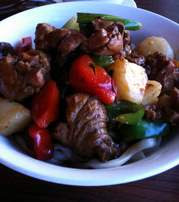 We order quickly (we're hungry and on a time limit) and the first dish that comes out is spicy chicken handmade noodles. The chicken is stewed in generous drumstick cut hunks with star anise, potatoes and green and red capsicum. The noodles are thick and random, easily handmade. Beef dumplings follow with a little bowl of chilli and vinegar. The beef inside is well cooked and has big cuts of greens mixed in, with a little squirt of juice as you bite in (but not too chin dribbly). I did end up with a few stains down my shirt! Mel proves an excellent food stylist and will be recruited for future adventures. I love this dry chilli that you can mix in with the vinegar and the juices of the chicken noodles. Our mate Matt practically eats this stuff by the spoonful! Two little dumplings and a splodge of chilli ready to make their way down my shirt. Glebe Noodle House is at 25 Glebe Point Road, Glebe. It is just up from two newer Chinese hot pot joints where Parramatta Rd joins in. Great for groups, sharing food and dribbling dumpling juices.